Alana from Tree House here! Earlier this week, I went on a ride along with Bob, half of our fearless Community Cats team known affectionally here as ZZTrap, thanks to their luxurious beards. The intention was to teach me more about the process and to get some great photos to show our community how hard these guys work to reach needy cats around the city. I got more education than I had anticipated. A large part of TNR (Trap-Neuter-Return), and very likely the most important part, is the Neuter (or spay, in the case of a lady cat.) 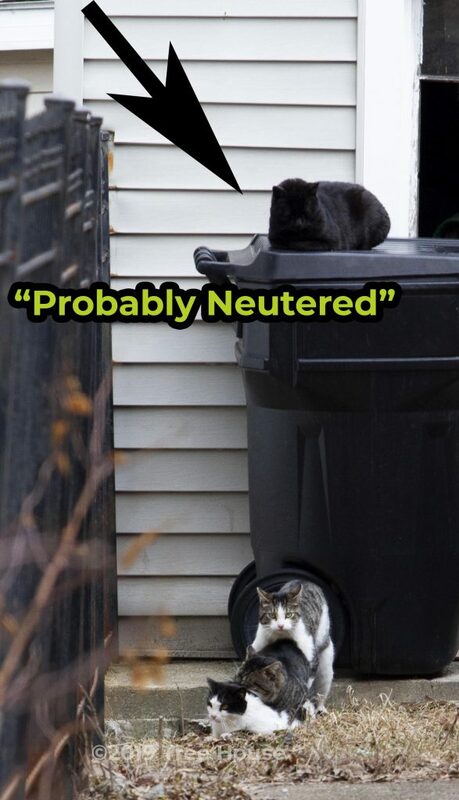 Every season that cats are left to procreate makes harder work for shelters and rescues in the future, and without the Neuter, cats take their duties very seriously and stay busy (pun kind of intended) all season long. The targets. They’ve spotted us. On this particular day, Bob was visiting a home that had numerous cats requiring our services and set up a plan for trap placement. Tree House uses humane traps (which we loan out free of charge for 2 weeks to intrepid trappers who want to help with Mission: TNR) with some delicious tuna to lure the little guys in. Once they’re trapped, we cover them with blankets to keep them calm and transport them safely back to our shelter where they’re cared for until their surgeries. Bob surveyed the space, discussed a plan with the homeowner who’d been caring for these cats, and set up his traps. And then we waited. After a brief period, we got one cat, a large male. He looked at Bob, Bob looked at him, he wondered why and how he’d been detained by a garden gnome, and then we covered him with a blanket to keep him calm and gently stowed him safely in our van. After a small catch, Bob re-assessed the trap placement, and then we waited. In the end, we caught five cats, all of who were taken in to Tree House and given the medical care they needed. All five were assessed for level of socialization, a process Tree House follows for all incoming cats. Any who love to be with people are adopted out and any who would prefer to live their lives without human contact are placed back safely and with kind parting words. After a successful trapping, Bob and I went out once more to do a site survey. 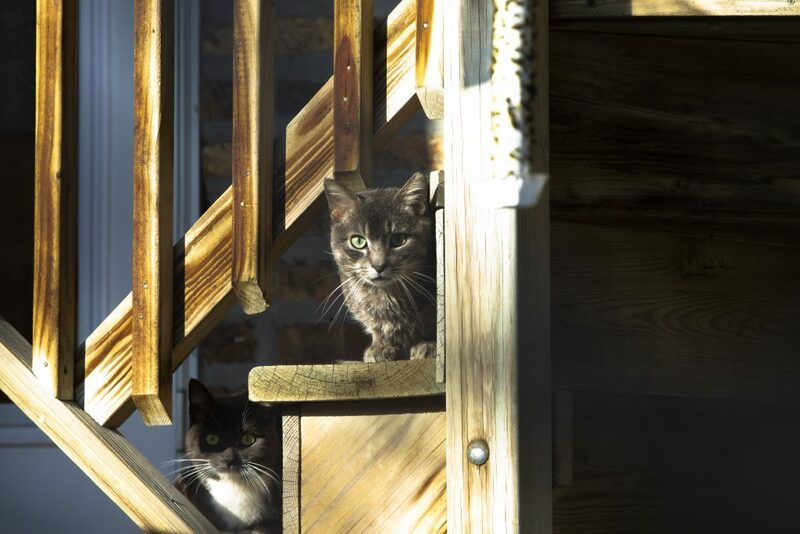 When Bob gets a call about cats needing help, he’ll visit the site first to see how many cats are around and what the situation is like so he can best prepare to help. After knocking on a few doors and talking to neighbors and other involved parties, Bob creates a plan and helps all the cats he can. If you’ve ever wondered why one litter of kittens might have brothers and sisters that look so different from each other, I believe Tree House has successfully put that question to bed for you, so to speak. Bob will be back to help these cats. I hope you enjoyed our Tree House Community Cats ride along and that you find it enlightening and informative. Should you feel the need to help further our TNR goals, we’re currently running our “Neuter is Cuter” campaign. $50 provides a neuter for one male cat and a good night’s sleep for innumerable lady cats. Thank you for all your support. We couldn’t do it without you. PS. Our blog now has a newsletter sign up on the home page! Enter your email to get notified about all of our upcoming blog posts. We publish one every Friday to let you know what we’re up to.